Fishing in kayaks has becoming a very popular sport these few years. These days’ couples with their small kid or their pet dog go on weekend fishing trips on the kayaks. It has turned out to be a very good recreational activity for many people. However, finding the best kayak paddle for fishing may be difficult due to the abundant choices on the market. The choice of the paddle for kayak fishing is very important. The paddles must be able to meet your personal requirements and most importantly, feels comfortable in your hands. With the best-suited paddles, paddling will feel like a breeze, giving you more time and energy for fishing. Read on to find out which fishing kayak paddles made it into our top list. You will also get an insight of each of their specifications and their pros and cons respectively. Below is a quick recap on our thoughts on the best kayak paddle for fishing. Complex and easy to store. Fiberglass and reinforced nylon blades. 2 Piece design for Easy storage and transportation. What Is a Hooked Kayak Paddle? 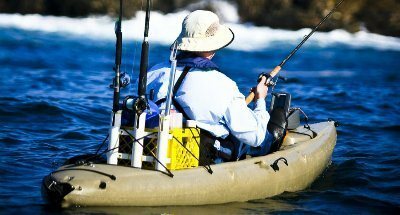 Why Choose a Kayak for Fishing? How to Choose the Right Kayak Fishing Paddle? If you are looking for a high performance, lightweight and quality kayak paddle, then there is no better choice than the Werner Camano Straight Paddle. It is made of high-quality fiberglass that offers the best swing weight. They have mid-sized blades that will suit most of the kayakers. It also offers great strength and flexibility that is a must for kayak paddles. You will enjoy very good paddle strokes thanks to its lightweight construction. The blade design is such that it allows the paddle to make smooth and effortless entry and exit of the waters. This model is the best for every fishing kayaker looking for an affordable paddle that offers top class performance. The best thing about this paddle is that it is lightweight and has a sturdy construction with performance-oriented blades. The blades can be set at 60 degrees or inline depending on your need. I love to use it in inline. This paddle cuts through the water easily and effortlessly. You do not need to apply all your force to get the paddle into action. It helps you to gain faster speed on your kayak very quickly. The shaft is made of fiberglass and the blades are constructed using nylon or glass. This makes the blades stiff, lightweight and durable. The Angler Classic from Bending Branches is an ideal option for all entry level paddlers. 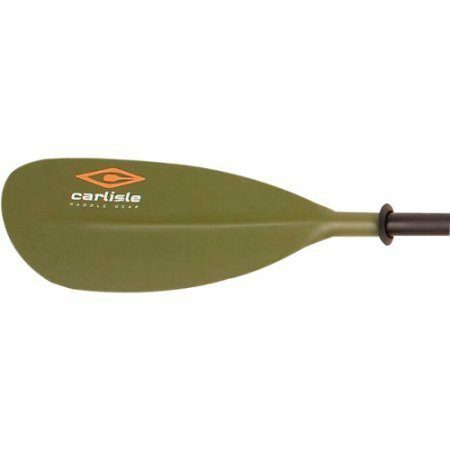 If you are looking for a perfect fishing paddle that helps you to take long trips in the waters, then Carlisle Expedition Angler Fiberglass Kayak Paddle is a very good option. 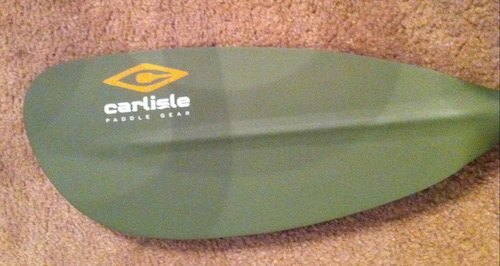 This paddle is lightweight and is perfect for those who love to paddle in the waters daily. The shaft, as well as the blades of this paddle, is made using fiberglass. This explains its lightness. The blades are made using the heavy durable material so that they do not get damaged easily. It is a perfect paddle for those who love aggressive paddling. This paddle is an ideal option for beginners to professionals. It is the best touring kayak paddle because of the fiberglass construction that will not weigh down your arms during long trips. The shaft and the blade are made using fiberglass and hence are easy on your arms. It helps you get to the fishing spot easily without wasting much of your energy. It will move in and out of the water with high speed and efficiency. This is a paddle that is designed especially for kayak fishing by the kayak anglers. The main focus is given to the paddle and not on the lines and the lures. This is a lightweight paddle that will not eat up a lot of your energy. Its shaft is fully carbonized and this ensures that the paddle is strong and durable. It weighs only 30 oz. Hence you can use it for long paddling without shoulder aches. The blades come with multi-laminate fiberglass construction and are a bit oversized. They offer great power and durability. This is one of the best carbon fiber kayak paddle for serious anglers. If you are looking for a mid-sized paddle that has low angle blades and suits paddlers of varying heights, then the Werner Skagit FG Straight Shaft Paddle is not a bad option. It is suited for recreational kayakers and entry level paddlers. 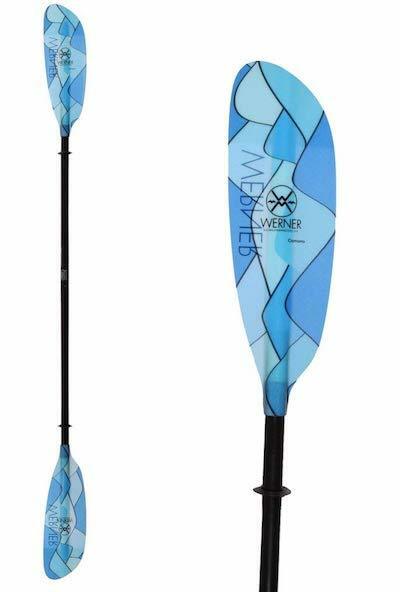 These Werner kayak paddles offer you smooth and very stable forward strokes because of the fiberglass nylon blades construction. It comes with an adjustable ferrule that has a feathering angle of 0 degrees to 75 degrees right or left. The swing weight is very light and therefore you do not feel any shoulder and arm fatigue when undertaking long paddling trips on the water. The hooked kayak paddles are the ideal paddles to use by anglers looking for enough energy and power in their shoulders to carry out fishing all day. These paddles will offer you all around low angle stroke that does not put the burden on your shoulders for the long fishing trips. It is important to choose the paddles that are lightweight and offers very light swing weight and stiffness to wade through the waters. No matter you choose the bending branches kayak paddle or paddles made by other leading manufacturers, make sure that they have a lightweight construction and very good blades that come with low angle options. You may be wondering why the fuss to use a kayak for fishing when there are boats and canoes available. If you ask this question to me, I would say that there is no better way to enjoy the waters than a kayak. I am a yak angler and I feel that the kayak fishing has an aesthetic appeal. There is nothing like paddling to the spot where fishes are there and then enjoying a big catch. There are elegance and wholeheartedness in the way you catch fish on your kayak. The use of the right kayak paddle shapes and the right sized paddles will ensure you enjoy effortless paddling. You do not have to spend thousands of dollars to buy a kayak. You get everything needed for a fishing kayak under $1000. You can easily find 240 cm kayak paddle and other fishing kayak gear under $150 or $200. The fishes can move away from the spot if they feel the motor boats hitting the water. But, by paddling your kayak to the fishing spots, you will be able to enjoy good catches as your kayaks do not make any noise. You can turn around if you have paddled over the fish and can hook up the fish easily. The kayaks require very less maintenance than your fishing power boats. You just need to give it a good hosing down to get it back to its original condition after fishing. You need to be worried about machines, oils, and fuel when using kayaks. The fishing kayaks can be launched from anywhere. It offers you the option to spend quality time with your small family and take them on a water excursion on lakes, ponds, and rivers. You should make sure you choose the right paddle by checking out the kayak paddle length guide for fishing. Finding quality kayak paddles doesn’t require much technical knowledge. However, knowing basic features of the paddles will help in finding the best fishing kayak paddles which offer the best performance. The type of paddle depends on the size of the kayak boat used for fishing, the height of the person etc. You also need to consider the durability, weight, material, blade design, shaft length, etc., to match your needs. Here are the features to consider when purchasing the paddles so that you can enjoy your fishing. The paddle length of fishing kayak mainly depends on the width of your boat, your seating position, and your height. If your boat is wide you will need longer paddles. If the paddler is tall, then longer paddles are the right choice. A paddler who is 5 feet tall and using boats with 23 inches of width will need a paddle that is 210 cm long. If the boat width is more than 32 inches, then he will need 230 cm kayak paddle or a 240-cm long paddle. If you use shorter paddles, there are chances that the shaft of the paddles or your hands to hit on the sides of the kayak during strokes. Longer paddles reduce the efficiency of the stroke. Going through the fishing kayak paddle length guide of paddle makers will help in finding the right paddle length. The best budget kayak paddle shaft selection helps in reducing the fatigue and discomfort felt in your shoulder and arm joints during kayaking. The shafts of the paddles come in two designs, straight and bent. The ergonomic design of the bent paddle shaft makes it more comfortable. You can make more powerful strokes with bent shafts than the straight shafts. It will not slide away from your lap when you are not holding it. 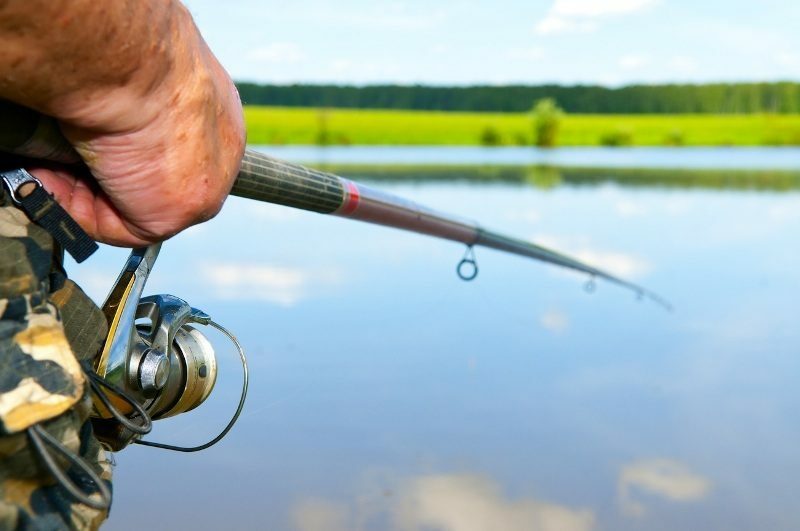 You will be able to handle bent shafts with a single hand if needed while you are fishing. Straight shafts need both hands to manage the stroke. There are shafts which are able to break down to facilitate storage. You can opt for two-piece paddles, or four-piece paddles depending on portability needs. It is better to opt for shafts with the diameter that allows a comfortable grip. Make sure that your thumb is able to touch the index finger when you hold the paddle. The selection of blade material will decide your fatigue level after kayak trips. There are plastic or nylon blades with specific variations such as a polymer, plastic blend with nylon, plastic blend with fiberglass, etc. Though plastic paddles are cheaper, they can crack and can get damaged when exposed to the sun for long. The flexibility of plastic or nylon blades reduces the efficiency of the stroke. Fiberglass blades come with a moderate price tag and offer durability and good performance. They are far more efficient than plastic or nylon blades. The Carbon fiber kayak paddle is most suitable for people going for daily fishing trips. They are very light in weight and exceptionally stiff. This helps in better energy transfer with each stroke. The different blade designs for paddles include narrow, wide, and dihedral blades. If you are planning touring long stretches, you need to find narrow blade fishing kayak paddles for sale. Narrower blades are lighter and suitable for long period use. If you are looking for quick acceleration for your fishing kayak, wider blades can provide the powerful strokes. Fishing kayak paddles with a J-shaped notch on the blade makes it easier to retrieve the fishing hooks and lines when there is any snag. Dihedral blades are asymmetrical and allow smooth flow of water over each half of the blade. It is easy to push through the water using a dihedral blade. Recreational or all propose blades with versatile design are ideal for kayak fishing. 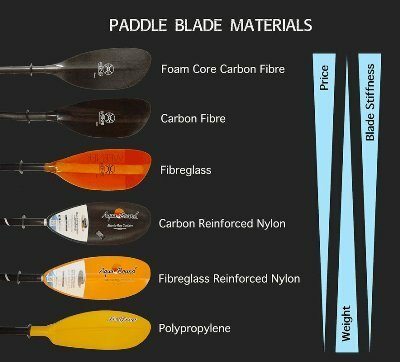 Fiberglass kayak paddle and carbon shaft paddles are the best choices if you are looking to get perfect value for your money. These shaft materials are lightweight and durable. 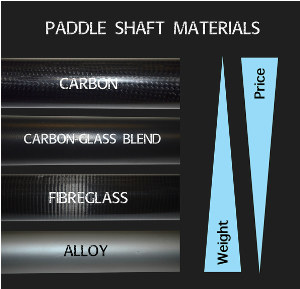 You can opt for carbon shafts with carbon or fiberglass blades or fiberglass shafts with carbon or fiberglass blades to get the lightest kayak paddle with the most efficiency. The price of these lightweight paddles will indicate their efficiency. Though aluminum is also a durable and lightweight shaft material, they can get very hot in the sun and can get very cold in winter conditions. Hence, most people do not opt for an aluminum shaft paddle. The kayak paddles for sale comes with two different blade alignment options: feathered and matched. Feathered blades are arranged in different planes at an angle. This reduces the resistance to the wind when the blade is pulled out of the water. In the case of matched alignment, the blades are in the same plane. There are paddle shafts which allow you to rotate the blades to make them matched or feathered according to the need. It is also possible to adjust the angles of the blades in feathered alignment. 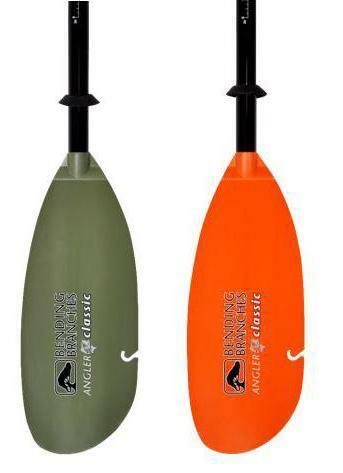 Matched blades are more suitable for fishing kayaks if you are not paddling to long distance. Matched blades are suitable for single–handed paddling. 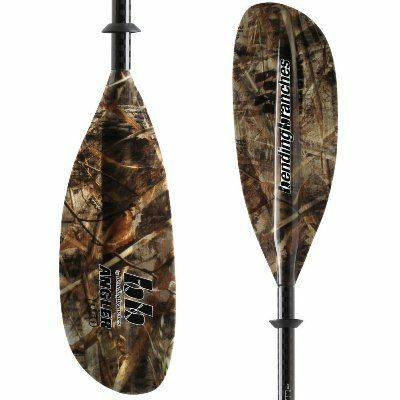 If you are looking for best-performing paddles for you to enjoy your whole kayak fishing session, you definitely need to avoid the cheap kayak paddles. 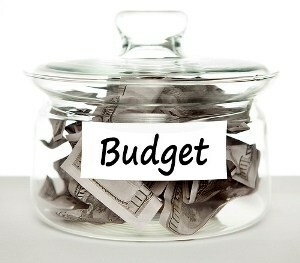 Though you may be able to save money by opting for cheaper models but you cannot ensure good performance and durability. With the more expensive paddles, they are going to last you longer and you will be able to use them for many years. As kayak fishing paddlers follow low-angle paddling style, paddles with a bent shaft, long shaft length, narrow-bladed and made of lightweight material will be the ideal choices. You will be able to cover large distances with less effort when you have long shafted light weight paddles with narrow blades. 1.How long should kayak paddles be? 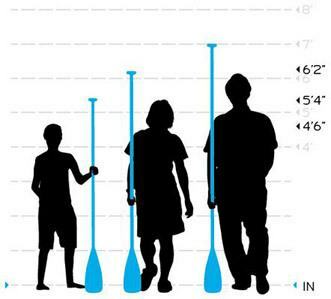 Kayak paddles depend on the height of a user. The taller a person is, longer paddle he will need. Paddles vary between 210 and 240 cm in length. Yes, all paddles are designed to float so you can easily pick them up if they fall into the water. 3.What size paddle do I need for a 10 foot kayak? For a 10 foot kayak, you need a paddle with a length of 220 cm. Of course, take into consideration your height. 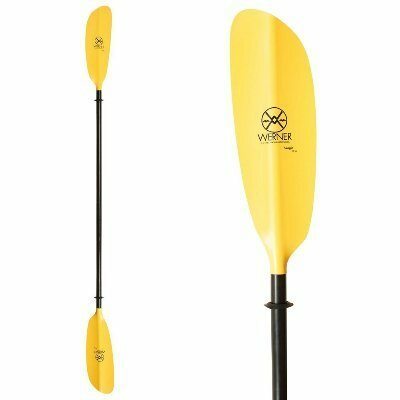 From the above kayak paddle review, it is clear that the Werner Camano Straight Paddle is the best affordable and feature rich paddle for the novice as well as experienced kayakers. There is no doubt that this is the best kayak paddle for fishing. We give this paddle a rating of 5 out of 5 for the features mentioned below. The most important feature about this paddle is that it combines very strong and sturdy design despite it being lightweight. You will not feel any pain in your shoulders when you paddle them for long fishing excursions. These are medium-sized paddles that suits people of all sizes. It is a low angle paddler designed for people who sit down in their kayak. Furthermore, it also has a take apart design so that the paddle can be transported quickly and easily after use. You do not have to worry about the storage space for this paddle. Glad you love the content. Cheers.